Santa Clara, CA – November 16, 2010 – Milestone Internet Marketing announced today the release of eBuzz ConnectTM 1.3, the next generation of the award-winning online Social Media Management solution that allows hotels, restaurants, and travel businesses to monitor, manage, and respond to reviews and comments in various online channels from an integrated single interface. 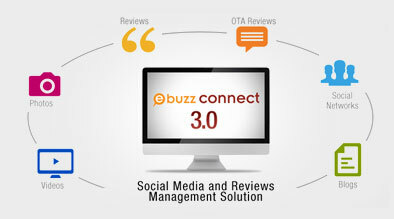 eBuzz ConnectTM provides a consolidated view of hotel’s position on all the review channels, online travel agencies, and social media channels such as Facebook and Twitter. Milestone launched the service initially in 2009 and has continued to invest in the tool adding more features to make the tool more actionable and focused on driving revenue. “eBuzz ConnectTM has significantly helped us improve our quality of services at our hotels and has had a direct impact on our revenue,” said Gary Gutierrez, CEO of HRI Lodging. “Our team uses eBuzz to monitor the social media channels and engage in conversations with our customers, which has improved our profile with our customers as well as helped us land new customers that were previously staying with our competitors. Tool’s new internal workflow feature has made it very efficient for our teams to review the comments and determine action plans,” he added. eBuzz ConnectTM 1.3 recently won the Web Marketing Association’s Outstanding Achievement award in the Web Applications category. Previously, eBuzz ConnectTM won the HSMAI’s Silver Adrian. I would like to learn more about eBuzz Connect. Also I would like to learn about the fee for this service. Thanks for your interest, Nunzio. We will contact you shortly to provide more information. Good post! It’s be exciting to watch how important Social Media will be for marketing and the internet as a whole. Here we perfecting a social media monitoring tool to stay on top of the landscape. How do you feel services like ours will impact the industry? Hi Megan – Thanks for your feedback. We are big supporters of actively monitoring social media and online review channels. eBuzz Connect is specifically tailored to the needs of hoteliers, helping hotels monitor their online reputation and connect directly with their guests. From an overall industry standpoint, the more people who monitor their brands and proactively engage in discussions with their guests, the more individual guests will be able to enjoy their hotel experiences.